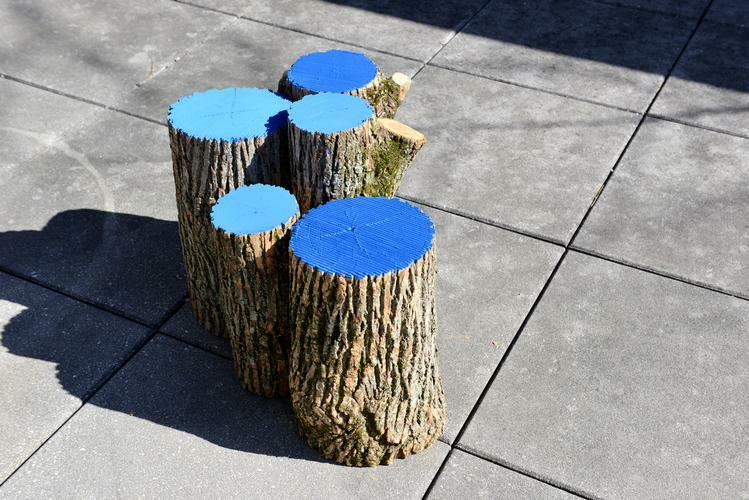 Since the mid-1990s, Jill Baroff has been strongly influenced by Japanese architecture, which she categorizes as “floor-based,” as opposed to the West’s emphasis on verticality. 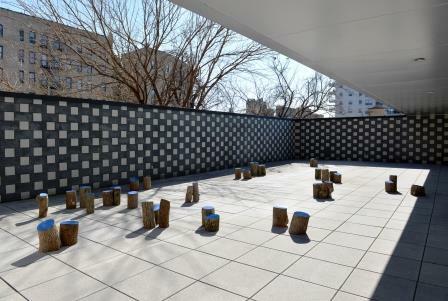 During a six-month NEA fellowship in Japan, Baroff was captivated by the way light traveled across the weave of her tatami floor during the day; constantly changing the patterns of the mats and consequently affecting the shape and feel of the interior spaces she occupied. In 1997, for an exhibition in Germany, Baroff achieved the same kind of effect using corrugated paper. 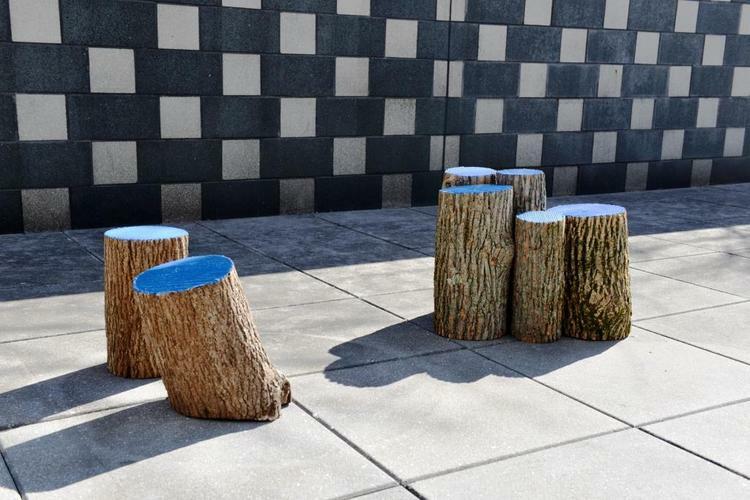 For the installation at the Bronx Museum Terrace, Baroff chose to work with tree trunks collected from a grove in Upstate New York. in a grove refers both to the site where the material come from, as well as to a short story by Ryunosuke Akutagawa, adapted by Akira Kurosawa in the film Rashomon, in which multiple eye-witness testimony of an event contains conflicting information. 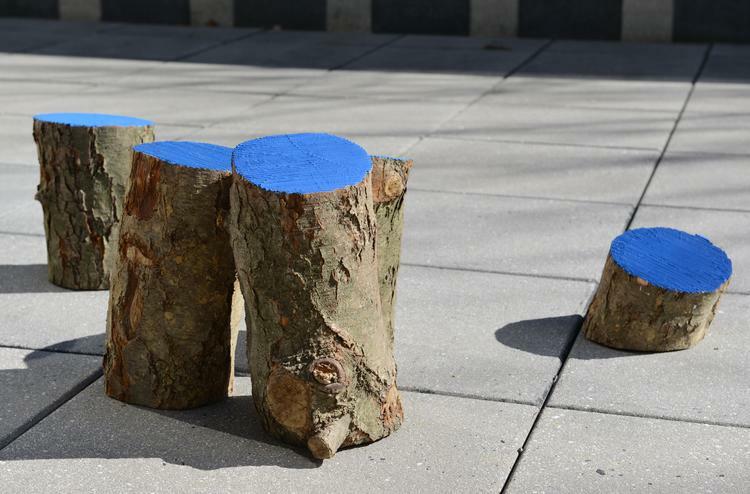 In Baroff’s installation, the top surface of each trunk has been routed by hand to create grooves, which channel light and capture shadow and has been painted with a single color. in a grove is a monochrome project that is perceived as intensely multi-colored. The viewer becomes the pin around which visual phenomena pivots. Jill Baroff’s work is represented in the following collections: Achenbach Foundation, Fine Arts Museums of San Francisco; Fogg Art Museum, Harvard University Art Museums, Cambridge; Museum Folkwang, Essen; Hamburger Kunsthalle, Hamburg; Kupferstichkabinett, Berlin; The Menil Collection, Houston; The Museum of Modern Art, New York; National Gallery of Art, Washington; Staedel Museum, Frankfurt; Staatsgalerie Stuttgart, Stuttgart; Yale University Art Museum, New Haven.